If you see me on the street and I look kind of round and white and yellow and lumpy with small red bumps, please don’t run away! I’d really like to meet you. My strange appearance is probably just because I’ve eaten my weight in this cauliflower and fresh corn salad over the past few days. It’s that good! Each time I opened the fridge over the past two weeks, my eyes would pass over a plump, beautiful cauliflower sitting on the top shelf. I didn’t buy the cauliflower for any specific reason, it was just too pretty and too reasonably priced to pass up. After repeatedly eyeing the cauliflower, day after day, I began to get the inspiration for this salad. I spent a few attempts getting it just right but, after tasting the final rendition, I was quite smitten. What a fun and delicious addition to our Spring/Summer recipe repertoire! I’m hoping you’ll love this unique, healthy salad as much as we do! 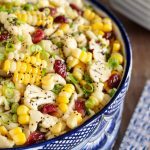 This cauliflower and fresh corn salad is a perfect side for picnics, potlucks and parties as it makes a big bowlful. 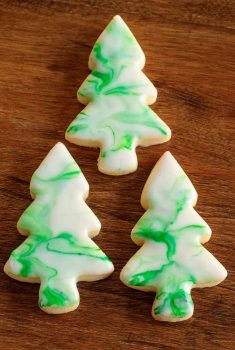 It also keeps well in the refrigerator (it actually gets better) so it can not only be made in advance but it would also be wonderful to make on the weekend and enjoy all week long. Many of the natural enzymes in vegetables are lost when they’re cooked. These enzymes help with digestion as well as fighting chronic disease. Raw vegetables have a higher vitamin content than their cooked counterparts. Vitamins A and C are particularly heat sensitive, so high temperatures can degrade their benefits. Antioxidants (important for cardiac health as well as lowering your risk of infections and some forms of cancer) can break down during cooking. Some water-soluble antioxidants might leach into the water as your vegetables cook, while other antioxidants might be neutralized by cooking oil, which naturally starts to oxidize as you cook. Eating raw veggies at the peak of their ripeness helps you get the most antioxidant bang for your buck. Eating more raw vegetables gives you a reduced risk of cardiovascular disease. This is probably due to the fact that preparation methods for raw vegetables are relatively simple and without a lot of fat and/or oils. The Mayo Clinic reports that raw vegetables retain more fiber than cooked and that a high-fiber diet can also help reduce the risk of obesity, heart disease and diabetes. In reality, the healthiest vegetables are the ones you actually eat! That being said, I think you’ll really enjoy the delicious raw veggies in this wonderful salad – definitely a win-win! What else do you need besides cauliflower for this salad? Pick up some fresh corn. I know it’s only April but I’ve already been getting delicious fresh corn for a great price. It’s not local at this time of year but it’s sweet and tender and adds a wonderful layer of texture, color and flavor to this salad. Other than the dressing ingredients you’ll also need a bunch of spring (green) onions and a bag of dried cranberries. That will do it. It’s a short list but, I think you’ll agree, the combination of veggies along with the sweet, tangy dressing is delicious and makes a really pretty presentation. 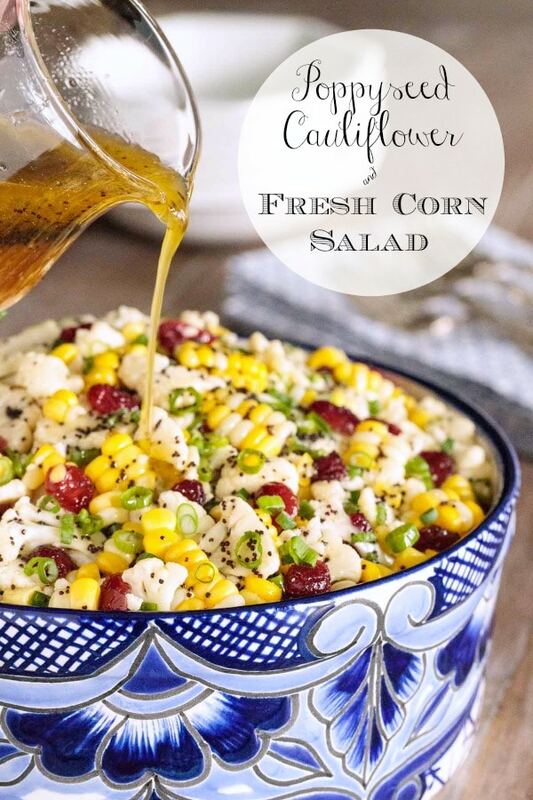 The dressing for this Cauliflower and Fresh Corn Salad is one of our favorites and super simple, our Lemon Ginger Poppy Seed Dressing. It’s bright, fresh, a little sweet and a little tangy. And easy! Just throw all the ingredients in a jar and give it a good shake. That’s it, almost too easy to be called a recipe, but so delicious, family and friends will think you’re quite a gourmet cook. The cauliflower in this salad needs to be thinly sliced. You can use a mandolin or slice it by hand with a nice sharp knife. I actually prefer slicing it by hand, but it will probably be quicker with a mandolin. A good knife is super important for preparing delicious food. I love my Global Knives. I’ve used them for years and they continue to perform beautifully. You don’t have to have a whole set to start with. If you’re just beginning your cooking career or have knives that are just worn out, this small chef’s knife would be a great place to start. It’s probably the knife I use the most. It would make a lovely Mother’s Day gift! Use a nice big cutting board for slicing. There will be lots of little bits of cauliflower (which can all be used in the salad) and it’s much easier to scoop them up off of a cutting board than having them scattered all over the counter. 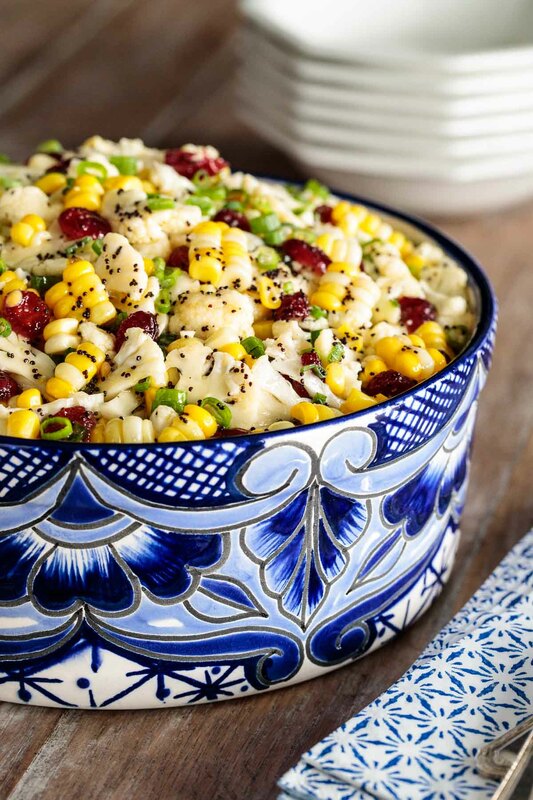 I think the multi-colored yellow and white corn is so pretty in this salad, but you could also use all yellow or white corn too. 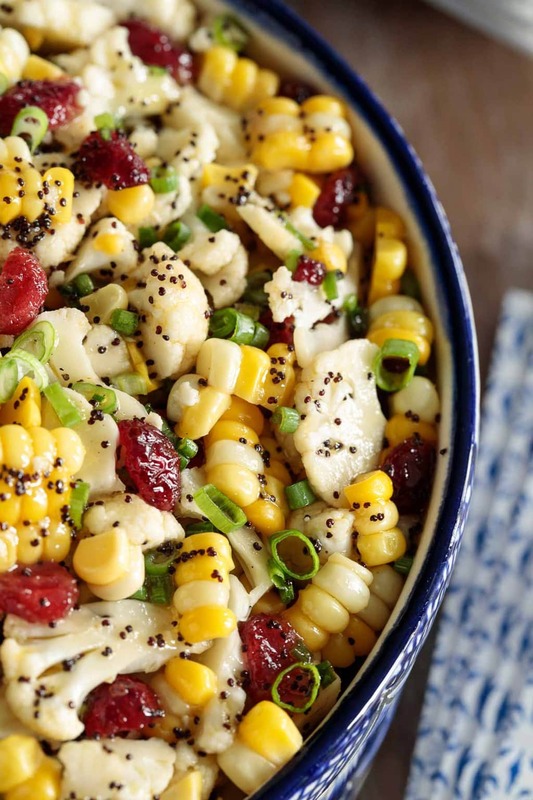 The corn in this salad is just lightly steamed. It will turn a slightly deeper color of yellow when it’s done. It will still be a bit crunchy, but sweet and tender at the same time. I cook it in the microwave with the husks on (see steps in the recipe below) but you could also prepare it in a pot on the stovetop. Just don’t overcook it. A few minutes in the microwave is perfect. 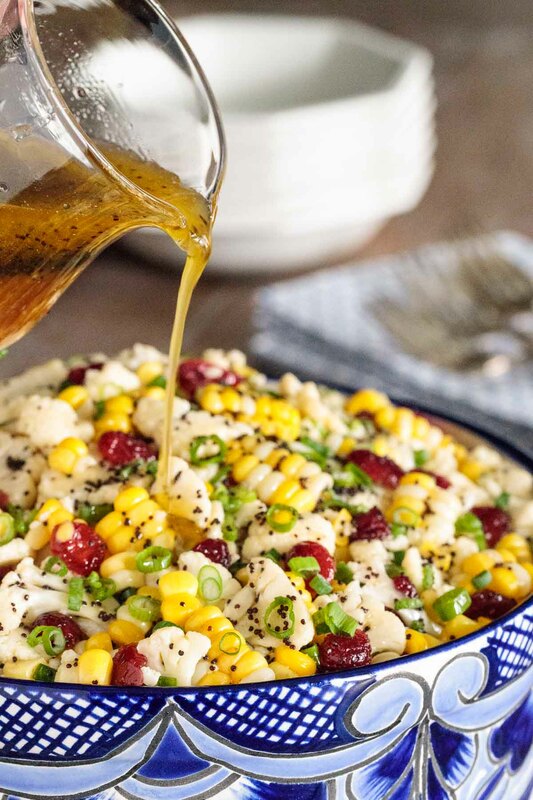 The salad dressing recipe will make more than you need for this cauliflower and fresh corn salad. Try it with simple greens, fresh fruit or a combination. The salad with keep well for 2-3 days. If making more than a few hours in advance, I like to reserve the dried cranberries until just before serving. By the way, if I see you on the street looking kind of round and white and yellow and lumpy with small red bumps, I won’t run away. Promise. 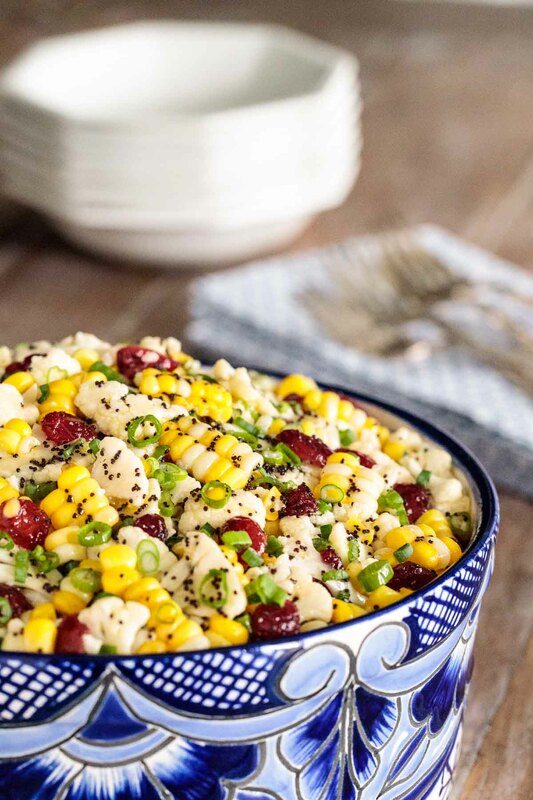 In fact, I’ll high-five you, maybe even do a little crazy cauliflower dance, knowing that you must love this cauliflower and fresh corn salad as much as I do! 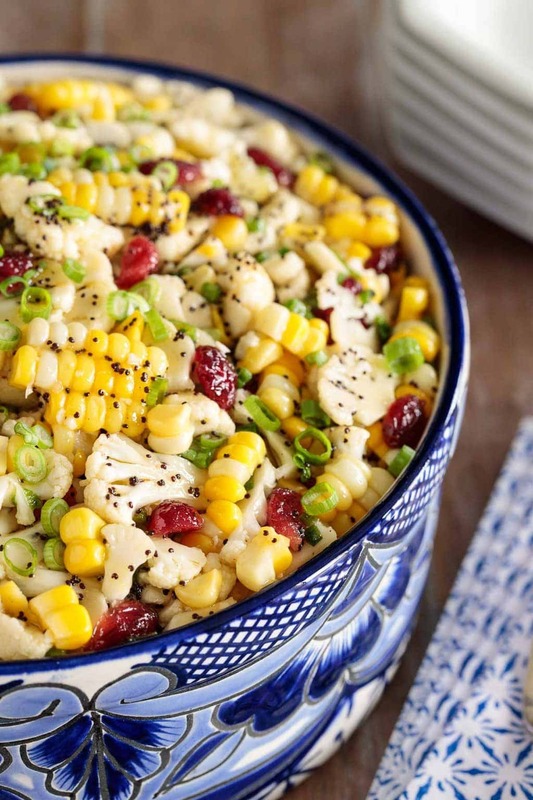 Loaded with healthy veggies, this Cauliflower and Fresh Corn Salad is crunchy and delicious. 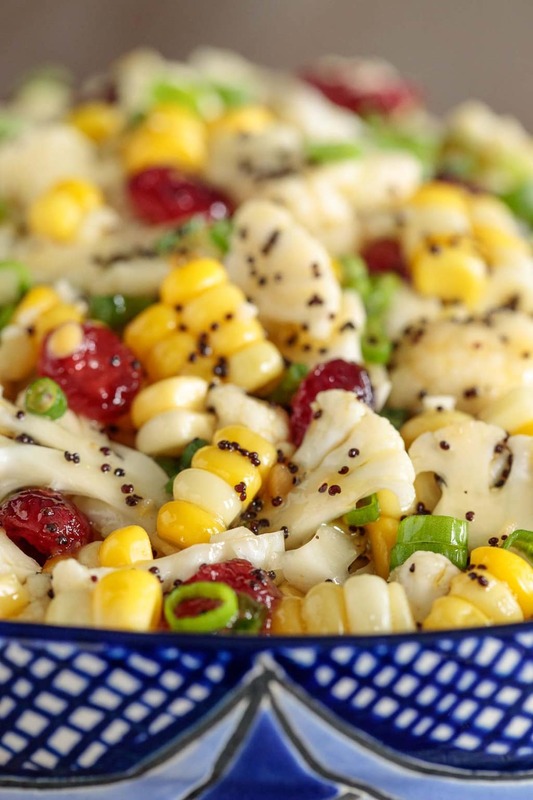 A sweet, tangy poppyseed dressing adds fabulous flavor! Place 3 ears of corn (with husks on) in the microwave. Cook on high power for 5 minutes. Remove with an oven mitt and allow to sit until cool enough to handle. Repeat with remaining 3 ears of corn. In the meantime prepare cauliflower. Trim cauliflower leaves and cut the core out and discard. Cut the trimmed head into quarters and break into florets. Using a sharp knife or mandolin thinly slice the stems and florets. 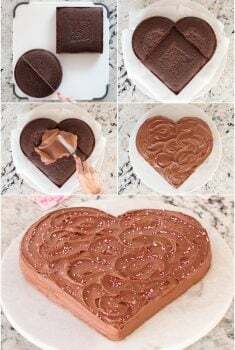 Break up any larger pieces into bite-size slices. Add all slices as well as the small remnant pieces to a large bowl. When corn is cool enough to handle, cut 1 inch off the bottom of each ear. Starting at the top (silk end), peel off husks and silk and discard. Check for and remove any residual silk. Cut kernels off of cobs and place in the bowl with the cauliflower. Add green onions (reserve 1 tablespoon for garnish), dried cranberries and 1/3 cup of the Lemon Ginger Poppyseed Dressing. Stir well to coat everything with the dressing. Drizzle a little more dressing over the top of the salad and garnish with reserved green onion. Serve and enjoy. The salad will keep well for 2-3 days. If making more than a few hours in advance, I like to reserve the dried cranberries until just before serving. See Café Tips above in post for more detailed instructions and extra tips. Nutrition facts do not include Lemon Ginger Poppyseed Dressing. Refer to that post for the nutritional info. Oh, this salad looks fantastic, Chris! Now I’m especially anxious for fresh Indiana sweet corn! Pinning this beauty! This does look like a great recipe! Can’t wait to get some corn and give it a try! Wow! 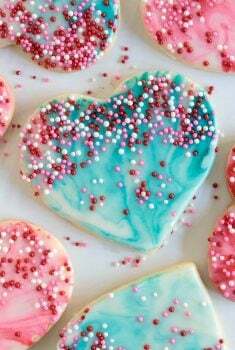 This looks divine!! Doing the family Easter Dinner and I just can’t wait to try this salad recipe and see how they like it! I’m quite sure it will be a hit! 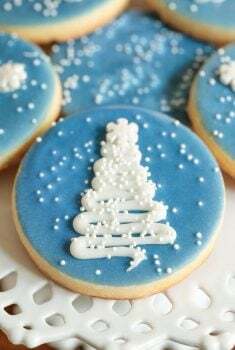 I just love your recipes and whenever I need something different, you are the first I turn to! Thanks for sharing so many wonderful ideas! Love all your recipes. Thanks for sharing. This recipe looks delicious. Thanks for your kind words, Shari, we appreciate you taking the time to leave a comment. Hope you enjoy this salad as much as we have!